As I sat in his office trying to process all the information I had just heard–about tumors, my diagnosis, treatment options, and the “non-curative”-ness of what I faced–I also attempted to wrap my mind around the fact that within a few short weeks I would be completely bald. Granted, in the grand scheme of things, losing my hair was a minor issue. I mean…it’s just hair, right? It will grow back. But combined with everything else, it was a difficult pill to swallow. I have often longed for straighter, “simpler” hair instead of the naturally curly locks I was (ahem) blessed with. 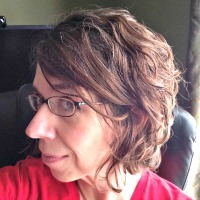 But my hair has always been the outward feature people comment on most: “Oh, I wish I had naturally curly hair.” (Trust me…it’s not all that glamorous.) “I bet you don’t have to do anything to your hair!” (Yes, if you consider applying a mountain of product to tame the beast “not doing anything,” then sure.) Something inside me ached at the thought of losing that part of my identity. Plus, after 35 years of manhandling my mane, I had finally tossed the straighteners and flat iron and embraced my God-given curls. I even began to like them… a little. And I was just waiting for 80s hair to come back, because let me tell you, this girl can rock some big-hair-band hair (see middle picture above)! So trying to take in the fact that I would soon kiss my newly-appreciated curls goodbye in addition to fighting for my life was a bit much for me to take in. I read a lot of blogs and articles and talked to a lot of people who approached their hair loss with a plan. Some faced it head-on by shaving their head first so they could be in control of when it happened. Others searched high and low for wigs that were so realistic no one ever knew they were completely bald underneath. True to my doctor’s prediction, my hair started thinning a couple of weeks after my first treatment. Just a few strands at first, and I thought it would be a slow transition. I had even heard of some people not losing their hair at all, and one could hope! The thinning continued slowly for a few days. Then, suddenly it started coming out in clumps…HUGE clumps! It happened so quickly, I wasn’t prepared to take the next step yet. I dreaded taking the next step and put it off as long as I possibly could (which was only a matter of days). Thankfully, I had plenty of hats to wear! I really wrestled with the timing of shaving my hair. I wasn’t worried about “looking different” or not having hair. I struggled with the fact that everyone would know what I was going through. I wouldn’t be able to go to the store, out to dinner, or anywhere else in public and pretend like nothing was wrong. 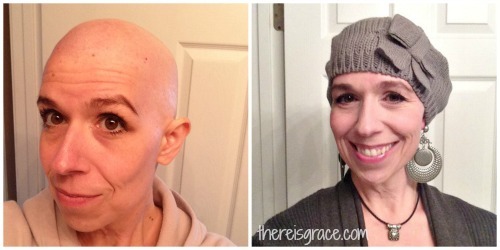 Once my hair was gone, everyone who saw me would know I have cancer. I finally grew weary of sweeping the bathroom floor and vacuuming my shirt multiple times a day, and I knew what I needed to do. Again, my friend Sheila, offered to come over and shave what was left of my hair. As with most things, the dread I had built up in my mind was worse than the reality. Once it was done, I could move forward and start thinking about how to work in all those fabulous accessories I had been collecting. I’ve always been pretty warm-natured, but I quickly discovered that without any hair on one’s head (or neck), one tends to get very cold…especially in Missouri…in October. For that reason, I preferred to wear hats that came down farther on my head. I also started wearing more scarves (around my neck or on my head) and head wraps. Yep, that is what it’s called (especially if you get a prescription from your doc, which you might want to do for insurance purposes…just sayin’). I wasn’t sure I wanted to get one (a.k.a. “a wig”) because I had heard they are incredibly uncomfortable and unnatural. But on a whim, Hubby and I stopped in a wig shop specifically for cancer patients. I decided to have fun with it, because honestly how many times in your life do you get the opportunity to try so many hair colors and styles at one time? I eventually discovered a cute little pixie cut that my husband swore was very natural-looking. It is eerily close to my original hair color, although not a style I would have ever chosen for my own hair. Still, I liked it. It’s fun. It’s cute. It’s warm. 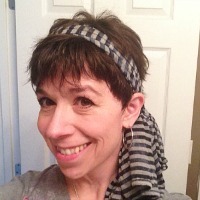 And bonus…I it looks great with a cute scarf tied around it! So, if you see me out and about, chances are you will see me in a hat, a wrap, or my cranial prosthetic. 😉 Pretty sure you won’t catch me walking around in my bald head, though…it’s just too cold for that! 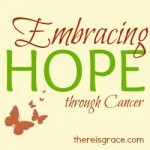 This post is part of the series, Embracing Hope. Be sure to enter your e-mail address in the box to the right so you can receive new posts delivered directly to your inbox! 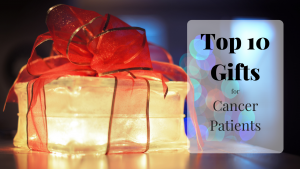 Amy recently posted…300 Likes Giveaway! Ha! You were not the first (or the last) to think that, Amy! Makes me feel good that is looks so natural! You never realize just how COLD you get without hair! I always have a turban by my pillow for when I wake up chilled. Or I just wrap the sheet around my head at night (in our bedroom without heat). You look lovely! With or without hair, it’s just a different look. 😀 I love that little grey hat. I absolutely love that grey hat too! And you smile and positive outlook an it all! You are a tower of strength, courage and hope! Thank you so much, Tanya. I can say I’m not always a pillar of strength, but it helps so much to have friends to lean on when my strength falters! Thank you for your kind words. Nancy, you look gorgeous! I LOVE the pixie. 🙂 Thank you for this post. I’m forwarding it to my aunt, who started her second round of chemo today. You are strong and brave in The Lord, and I know God is using your honesty and transparency to help others. Thank you, Kristen. I hope your aunt was encouraged by the post, and I pray her treatment is going well. You are truly an inspiration. You and your family are in our prayers. Laurie, it’s so sweet of you to say…thank you! We appreciate all the prayers, too. Thank you for following my journey. Kiss little Emily for me if you see her over the holidays! Fantastic, Nancy. You look lovely before, during, and soon to be after. Thanks for sharing. I will forward this to my friend for the video. Gorgeous with or without! And I must say, your “cranial prosthetic” does look very natural and super cute! Hi Nancy! I had no idea what kind of planning goes into realizing that you will lose your hair. Sounds like you had just the right people, at just the right time to help you too. Ha! So fun, Rosann! We would have been the big hair twins…of course everyone’s hair was big back then, I guess! Thank you for stopping by, Vito. And thank you for your kind words. I have been recently been diagnosed with Hodgkin Lymphoma and will be starting chemo in the next couple of days. My hair is just like yours was before you lost it. I have three young daughters and my biggest fear about losing my hair is exactly as you talked about…now there’s no hiding it from anyone that I’m sick. I want to be able to just be my girls’ mom at the park or library, not the sick, bald lady. Your words have given me hope and encouragement that I can embrace this upcoming chapter of my life. I may be sick but I don’t have to let it be all that I am. Thank you for that! Nancy, I just read your article. Thank you so much. I, too, went through the stages of hair loss. I cut my hair short before starting chemo. I also ran out and bought a wig but ended up wearing it only a handful of times. My hair fell out 2 weeks to the day of starting chemo. I remember pulling out clumps at a time. I went for the buzz cut and my husband shaved his head too. Nancy…I just came across your article through Pinterest. 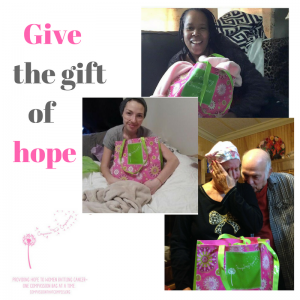 I was diagnosed with breast cancer, and I had my first chemo treatment 12 days ago! I also cut my long hair into a pixie cut, with the rationale that it would be easier on me to lose short hair than all the long hair that would probably totally clog my shower! I keep waiting for it to come out, but so far, so good! I’ve already collected several scarves, hats, beanies…but I don’t think I can do the wig, even though it’s October here in Georgia! I have one question…I’ve been told I’m going to lose ALL my hair everywhere! Did you not lose your eyebrows? Just curious…..Thanks! Hello- your blog could have been mine! I had super curly long hair myself. I am dealing with the fact that everyone knows about my battle. It was so much easier to fake- it with hair. You handled it with grace- I hope I can too! I’m 33 and starting chemo in 2 weeks and this is the part I am really struggling with. I am buying and ordering everything I could possibly need but I still don’t feel prepared. I feel like I can deal with everything but losing my hair anf actually having people know I’m sick just breaks my heart to no end. Thanks for read- It helps to know how fast the process goes and what really happens- I appreciate it. Hope you are doing well. My name is Nancy too and I pretty much did everything the same as you. Actually I bought a wig then came home and cut my hair very short. It’s still coming out but mostly gone. I just had my second chemo two days ago. You have stated my struggle so well. It wasn’t being bald that bothered me. It was that people would know what I am going through. We’ve had three stillbirths after 35 weeks in the past five years and I could feel normal in a crowd because no one knew. Cancer is something I cannot hide and it bothers me more than I ever thought it would. 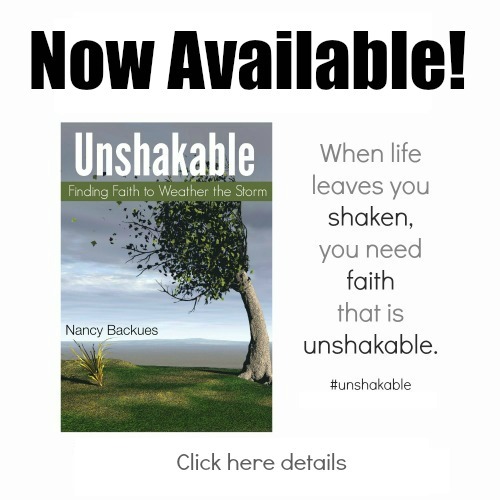 Hello Nancy, I just stumbled upon your webpage and had to read and understand every word therein… You’re an inspiration! 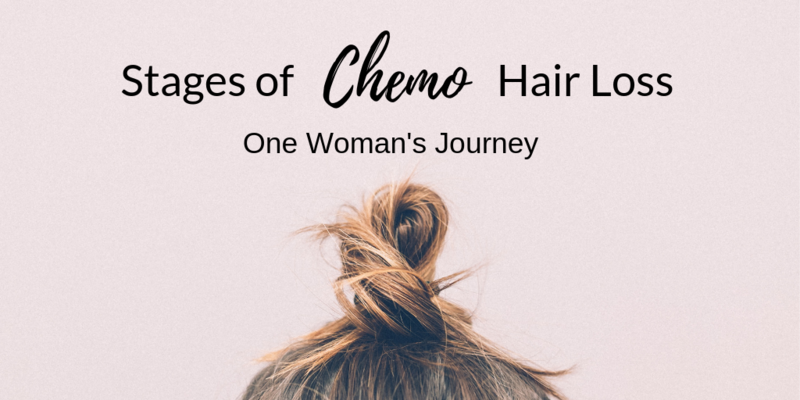 I was searching for the topic chemo hair loss and found your blog. 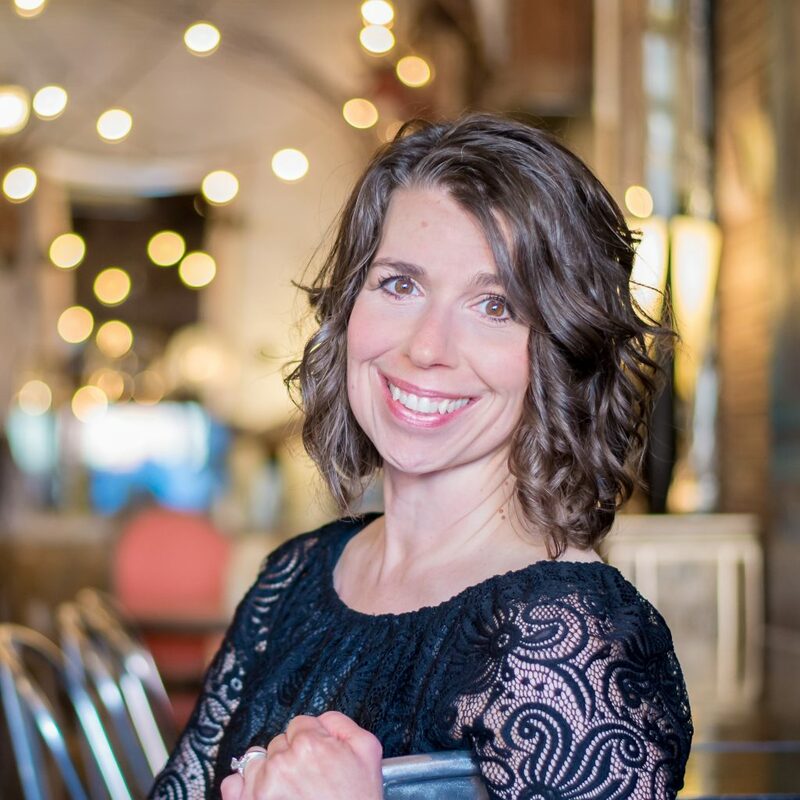 I’ll share your story with my audience… They need to see this! Thanks for Sharing! I too am going through Chemo. 4th. treatment done with many more to come. My thinning hair really had me ready for the loss. Thank you for sharing your story. My husband shaved my head for me. Loving jokes helped me with the process. He says he never knew how small my ears are. I just wanted to share with someone going through the process and say thank you again for sharing your story. I was searching the web for topics on chemo hair loss and how fast I would lose my hair. I came across your blog about your story and I have to say subconsciously I already started the phases process. When I knew that I was going to lose my hair I cut my hair very short, an asymmetrical Bob. 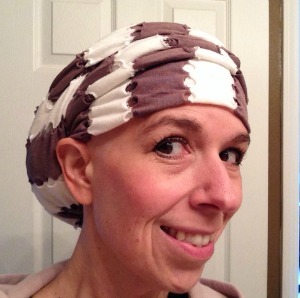 I am 31 with two small children and about to undergo six months of chemo. Your story really did help me. I have stage III invasive out of the carcinoma and I am currently a survivor hoping that I do not get metastatic cancer. That is what the aggressive treatments are for. I would be lying if I said I wasn’t scared to death. But I’m hoping that I handled the treatment well. You are such an inspiration ♥️. I’m just 16 year old boy from India, I was just 11 years (in 2013) old when my cancer treatment started. But at age of 15 cancer came back again in my life with a storm. My final chemo starting today. But I’m just worried about my future life, how it will be?! I had already survived cancer 2x. I don’t wanna face cancer again. I came across your post on Pinterest. Your description of the phases was exactly what I went through. I was surprised to discover that your strongest feelings about being bald had to do with not wanting everyone to know you are sick. That is exactly how I feel too. I found my first wig uncomfortable and hard to manage. I just got another one with a pixie cut. I love it and the ability to go out and look natural and not like a cancer patient. Sometimes it’s nice to forget you have cancer for a little while. I’m on chemo treatment 4/6 this week. I’m starting to imagine and look forward to my hair growing back. Thanks for sharing your story. Sometimes it’s just nice to know you’re not the only one.